Girl is NOT a 4 Letter Word: Updated Invite List For Boise, X-Games Women's Park Qualifier. Updated Invite List For Boise, X-Games Women's Park Qualifier. 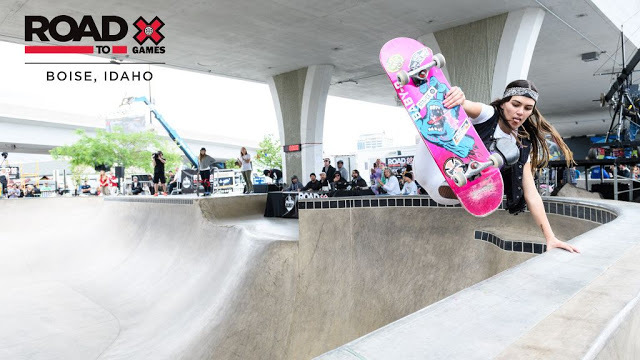 X-Games has updated the list of the women's skateboard park invited athletes and there are a couple new names on it from the last time we posted back in April. Looks like both Spencer Breaux and Bella Kenworthy have been added to the invite list, and will be joining the other women in Boise. We are bummed to see that Dora Varella is now missing from the new list. Skateboard Park is the discipline going to the Olympics in 2020 (along with Street) so that is the event all these girls - who normally skate bowls/vert - need to focus on mastering - if making the Olympic team is on their agenda. Road to X: Boise Qualifier, taking place June 15 - 16 at Rhodes Skate Park. The Park events serve as an official qualifying event for the X Games Minneapolis Park competitions. The top four Women’s Skateboard athletes, not already invited, will qualify into the X Games Minneapolis Park competition. Here are the 21 female park skaters who received invites to Boise, Idaho for X-Games qualifiers. * Lizzie Armanto (Santa Monica, California) – The first female skater to be featured on the cover of Transworld Skateboarding and the first female in 24 years to land a Thrasher cover, Armanto turned pro with Tony Hawk’s Birdhouse team in 2017. Armanto is a two-time X Games Skateboard Park medalist with gold and silver in three appearances. * Nicole Hause (Stillwater, Minnesota) – After narrowly missing the X Games Minneapolis podium with a fourth place finish in Skateboard Park 2017, Hause is on fire this season. She will come into Boise hot off wins at the Vans Combi and Vert Attack competitions. * We are personally adding Sakura Yosozumi as well as Yndiara Asp to the "must watch" list - after seeing them both blaze through qualifying and the finals to take first place and second place respectively, at Vans Park Series, Brazil a couple weeks ago- they are on our radar to watch! The event will also be streamed live June 15 – 16 through the X Games Facebook page and YouTube channel. In addition to the live stream, fans can catch the Boise Park Qualifier coverage on ABC as part of the World of X Games content on June 23, as well as coverage across X Games digital and social platforms.